As we were getting ready for dinner on Saturday night, we got a call from a shelter we have worked closely with for years. They had an emergency and they were hoping that we could help them. A “rescue” had come to the shelter and pulled 2 dogs. One of the dogs was a pup named Igor who was a senior that was horribly matted. 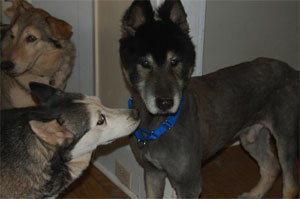 The “rescue” gave Igor a badly needed haircut and took both dogs to the vet. During that vet visit, the “rescue” was told that Igor was unadoptable because he had a giant mass on his hind leg, age related health issues (arthritis and some bad teeth) and had been diagnosed with degenerative myelopathy. What happened next is unfathomable. The “rescue” left the vet and drove back to the shelter to return Igor. Anyone that has ever been involved with rescue knows that returning a senior dog with health issues to the shelter is essentially a death sentence. As soon as we heard what had happened, we said “how soon can we get him?” Volunteer, Dave C., got in his car Sunday morning and drove to the shelter to pick up our newest family member. He was a wonderful passenger and greeted Dave with gentle kisses. We could not believe the size of the tumor when we first saw it. We totally understood how the poor guy was having difficulty walking. The pack welcomed him and he even tried playing a few times. We decided that Igor was not a fitting name for this guy, so we chose to change his name to Radar (have you seen those ears???). After consultation yesterday with the vet, Radar’s surgery was scheduled for today. The mass was removed, as well as his male parts (neuter). We are hopeful that the mass is benign and we should find out in about a week. The surgery went well without complications and Radar was able to return to the Farm today for crate rest and recovery. We are so grateful that we were able to give Radar a second chance. Welcome Radar!